The record is made up of 1 volume (290 folios). It was created in 15 Aug 1905-2 Apr 1906. It was written in English, Arabic and French. The original is part of the British Library: India Office The department of the British Government to which the Government of India reported between 1858 and 1947. The successor to the Court of Directors. Records and Private Papers. Document E elatinq to the C ase op S alim- Bin-S eif. Sir J. Hardinge to the Marquess of Salisbury. to him of the 10th instant he has not again addressed me on the subject. Slave Trade from Pemba will be greatly affected by its solution. lation of this judgment is enclosed herewith. the convict's dhows will be duly returned to the French Consulate. Inclosure 1 in No. 1. M. Laronce to Sir A. Eardinge. M. 1'Agent et Consul-General, Zanzibar, le 8 Juin 1898.
amene de Pemba le meme jour a Zanzibar sous escorte pour un fait de Traite. de moi Tassurance que le prisonnier etait bien protege Fran9ais. Correspondence relating to the Hague Arbitration Tribunal which decided on questions referred to it by Great Britain and France concerning the flying of French flags by dhows in Sur. Before the 2nd January 1892 when the Brussels Conference General Act was ratified France was entitled to authorize vessels belonging to subjects of the Sultan of Muscat to fly the French flag only and be bound by French legislative rules. 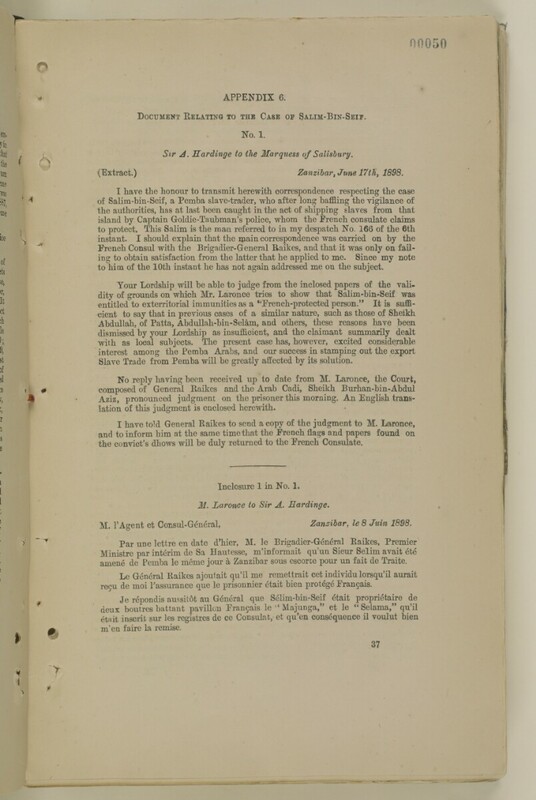 Includes a list of dhows and dhow owners flying the French flag as well as printed copies of the material submitted to the tribunal and the 'Award of the Arbitration Tribunal appointed to decide on the question of the grant of the French flag to Muscat dhows'. Letters discuss the desire of the British to increase the authority of the Sultan of Muscat in Sur. Correspondents include Major William George Grey, Political Agent A mid-ranking political representative (equivalent to a Consul) from the diplomatic corps of the Government of India or one of its subordinate provincial governments, in charge of a Political Agency. , Muscat; Percy Zachariah Cox, Political Resident A senior ranking political representative (equivalent to a Consul General) from the diplomatic corps of the Government of India or one of its subordinate provincial governments, in charge of a Political Residency. Persian Gulf Historically used by the British to refer to the sea area between the Arabian Peninsula and Iran. Often referred to as The Gulf or the Arabian Gulf. ; Secretary to the Government of India in the Foreign Department; Foreign Office, London; Saiyid Faisal bin Turki [Fayṣal bin Turkī], Sultan of Muscat; Monsieur Laronce, French Consul, Muscat. The papers are arranged chronologically from the front to the rear of the file. An index to the file is given. Foliation: the foliation sequence commences at the front cover and terminates at the back cover; these numbers are typed, with additions, clarifications and corrections written in pencil. This sequence can be found in the top right hand corner of the recto The front of a sheet of paper or leaf, often abbreviated to 'r'. side of each folio.